Associate Vice Dean of Distributed Medical Education and Academic Lead for the Physicianship Component at Outaouais Medical Campus at McGill University in Montreal, Que. Associate Professor in the Department of Family Medicine at McGill University and Senior Investigator at the Lady Davis Institute in Montreal. Associate Director of Research, in the Department of Family Medicine, at the University of Alberta in Edmonton. Professor, in the Department of Family Medicine at the University of Alberta in Edmonton. Overdiagnosis was well recognized in the second half of the 20th century from the advent of widespread screening for cancers.1,2 However, overdiagnosis has received much more widespread attention by health care providers and policy makers in the 21st century following the seminal writings by Welch and Black.3 Initially, there was astonishment that diagnosis of a disorder such as cancer might not be of benefit. It is extremely important to recognize and increase awareness of the phenomenon of overdiagnosis, as it is one of the most common and unavoidable consequences of screening and early detection of any disorder. Overdiagnosis should, therefore, be an essential component of background information discussed with individuals who are contemplating screening as part of shared decision making. It should also be considered before any diagnostic test is ordered. Linda is a 74-year-old woman with right-sided hemiparesis after a stroke. She was diagnosed with a small breast cancer after screening mammography a year ago. She underwent a lumpectomy and radiation therapy. Linda believes that mammography saved her life and becomes a breast cancer screening advocate. For the past year, she has been telling her 50-year-old daughter Sarah to undergo mammography. Your colleague, who is their physician, is just back from a conference and wonders if Linda was diagnosed with a cancer that was not destined to alter her life if it had remained undetected (ie, was she overdiagnosed?). He brings up the cases for discussion at monthly rounds in your group practice. Gerald is a 65-year-old man who presents for a periodic health examination at the request of his wife. He states that he feels well and has no specific health issues or complaints. He is currently working and he participates in a variety of outdoor activities. During the examination you mention the possibility of screening for abdominal aortic aneurysm (AAA) with ultrasound as part of routine investigations. Gerald agrees to your suggestion. Gerald subsequently returns for follow-up discussion of the results of his abdominal ultrasound, which revealed a 33-mm AAA. Gerald expresses feelings of disappointment, anxiety, and apprehension regarding his diagnosis. He indicates that he is worried that he could suddenly die and that he could be a risk to other individuals. Gerald subsequently alters his lifestyle to reduce physical activity, retires from work, and reduces his plans to travel. He undergoes yearly ultrasounds that show minimal increase in size of his AAA. Gerald dies at age 85 from an unrelated medical condition. Misdiagnosis and false positives are related but distinctly different concepts. Misdiagnosis is an incorrect diagnosis of a condition, often owing to lack of diagnostic specificity—for example, cellulitis when a patient has swelling and redness of the great toe owing to gout. False positives occur when an initial test result is positive for an abnormality, such as microcalcification seen on mammography, but a follow-up test (eg, biopsy) result reveals no disease. Misdiagnosis and false positives can also lead to harms due to subsequent investigations and unnecessary treatment. Overdiagnosis is self-perpetuating. Those who might have been overdiagnosed, such as Linda, encourage others to undergo testing without considering the potential harms of testing and subsequent workup or treatment. Increasing use and overuse of tests can lead to detection of unrelated incidentalomas, a version of overdiagnosis. For example, increasing use of imaging tests (eg, computed tomography [CT] scans, including CT colonography) leads to detection of unrelated asymptomatic conditions such as renal carcinoma or a small aortic aneurysm.11 Consequently, it was demonstrated recently that nephrectomies were linked to the number of scans done, not to the actual incidence of renal cancer. Overtreatment through surgery is now recognized to be one of the risks of excessive CT imaging. Overdiagnosis can also occur when there is concurrent disease that leads to death and the overdiagnosed disease would not have had time to progress to being symptomatic, as is likely for both the cases described above. 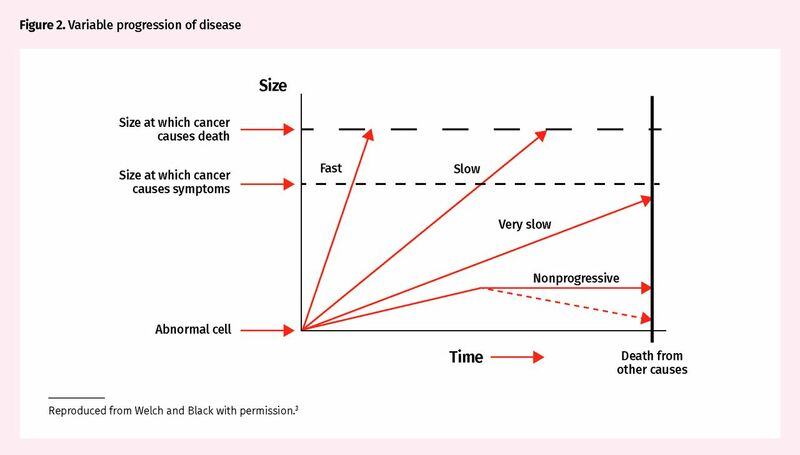 Although first described in the setting of cancer diagnosis, overdiagnosis can occur with many conditions,21 especially those that have a long indolent phase. Nevertheless, more studies on overdiagnosis have focused on cancer diagnosis than other conditions. It is expected that the intervention arms of randomized controlled trials (RCTs) of screening would initially demonstrate higher detection and incidence rates. If this were all due to early detection of diseases, it should lead to equivalent decreased incidence later on. In addition, there should be a concomitant decreased incidence of advanced disease. Also, if the screening intervention detects precancer conditions and prevents development of cancers or disease, then there would be an overall reduction in cumulative incidence of the disease.24 Thus, if there were no overdiagnosis, after a long enough follow-up, the overall incidence of cases would be the same in both groups or decreased in the screening group. 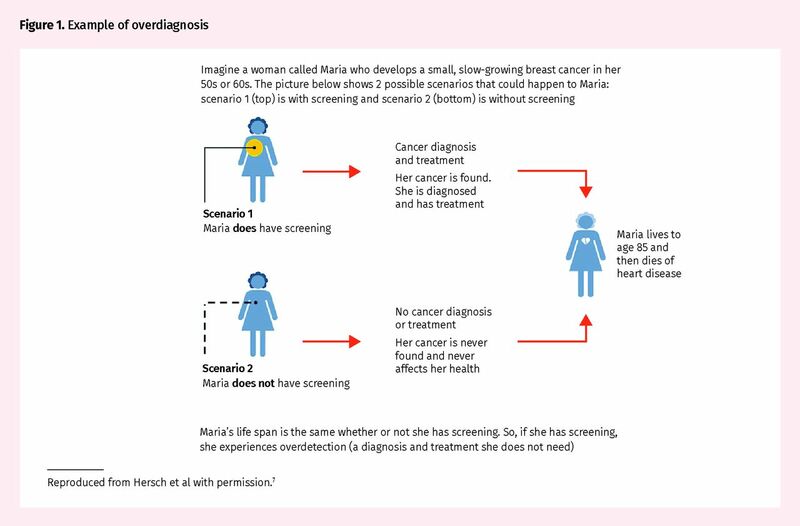 The Canadian National Breast Screening Study demonstrates that the cumulative increased incidence in the screening and intervention arm usually persists without a later decrease in incidence even when long-term follow-up is available; this is an example of overdiagnosis in the screened group.25 Detecting pre-disease or early disease and changing the outcome is the goal of screening. Unfortunately, there is always a balance between cases in which it might be possible to change the outcome and overdiagnosed cases where we are causing harm. The pattern in clinical practice most frequently seen and indicative of overdiagnosis is when trends over time demonstrate an increasing incidence, especially of early-stage disease with no or minimal progression to serious disease (ie, advanced disease or cause-specific mortality). As an example, thyroid ultrasound became available in 1980. The incidence of thyroid cancer has been increasing in Canada since the early 1990s, with minimal reduction in mortality due to thyroid cancer (Figure 3).10 This pattern suggests overdiagnosis due to diagnostic testing. The extent of overdiagnosis is estimated from follow-up within RCTs, observational studies (such as ecological studies and trends of incident diagnosis and concomitant death over time), and modeling studies.26 Each method has limitations. For RCTs, estimates require long-term follow-up (which might not be available) and assessment under ideal experimental settings. Ecological studies are vulnerable to unidentified confounding. There are many assumptions made for input variables in modeling studies. Indeed, all study designs make inherent assumptions, which lead to varying estimates. There is ongoing debate on the best method to measure overdiagnosis.27,28 Currently, it is recommended to quote the range of magnitude of overdiagnosis, the denominator used, and the method of estimation used. It is very difficult to explain the concept of overdiagnosis to individuals who believe they benefited and survived because of screening, even though they were likely overdiagnosed. So, you might not want to approach the issue with Linda. But, more important, Sarah has not been screened yet and should be informed of the potential benefits and harms of screening. Our role is to help her arrive at a decision congruent with her values and preferences after providing the known evidence of potential benefits and harms. What would be sad would be for her to make a decision without the pertinent information and without the chance to reflect on her values and preferences toward that type of screening. Clearly Gerald was overdiagnosed with AAA and suffered the harms of overdiagnosis. Although traditionally 30 mm has been used as the cutoff for diagnosis of AAA, there have been suggestions to lower the threshold of AAA diagnosis, which might tip the balance of AAA screening to net harm.32 It is important to discuss the potential benefits and harms, including that of overdiagnosis, before implementing weak recommendations such as those for AAA screening. Overdiagnosis is inherent in most screening and diagnostic activities. The magnitude varies for different disorders. The possibility of overdiagnosis should be considered in clinical decision making before ordering any screening or diagnostic tests, and it is important to communicate the possibility of overdiagnosis in shared decision making before individuals enter the screening cascade. ▸ Overdiagnosis refers to the diagnosis of a condition that otherwise would not have caused symptoms or death. It is an inevitable consequence of screening and diagnostic testing, and can result from increased sensitivity of diagnostic tests or excessively widened disease definitions. ▸ Harms from overdiagnosis occur because of unnecessary diagnostic tests, treatments, and follow-up from which the patient does not receive any benefit. ▸ Estimates of overdiagnosis can vary owing to differences in the methods and sources used to compute rates. ▸ Shared decision making between patients and physicians supported by well-designed decision aids is recommended to minimize the harms associated with overdiagnosis. 1. Welch HG, Schwartz LM, Woloshin S. Overdiagnosed. Making people sick in the pursuit of health. Boston, MA:Beacon Press; 2011. 2. Pathirana T, Clark J, Moynihan R. Mapping the drivers of overdiagnosis to potential solutions. BMJ 2017;358:j3879. Epub 2017 Aug 6. 3. Brodersen J, Schwartz LM, Heneghan C, O’Sullivan JW, Aronson JK, Woloshin S. Overdiagnosis: what it is and what it isn’t. BMJ Evid Based Med 2018;23(1):1-3. 4. Too much medicine [collection]. London, Engl: BMJ Publishing Group; 2018. Available from: www.bmj.com/specialties/too-much-medicine. Accessed 2018 Jul 24. All authors have completed the International Committee of Medical Journal Editors’ Unified Competing Interest form (available on request from the corresponding author). Dr Singh reports grants from Merck Canada, personal fees from Pendopharm, and personal fees from Ferring Canada, outside the submitted work. The other authors declare that they have no competing interests. La traduction en français de cet article se trouve à www.cfp.ca dans la table des matières du numéro de septembre 2018 à la page e373.
. Some pitfalls in the evaluation of screening programs. Arch Environ Health 1969;19(3):412-5.
. On the diagnosis and treatment of breast cancer. JAMA 1979;241(5):489-94.
. Overdiagnosis in cancer. J Natl Cancer Inst 2010;102(9):605-13. Epub 2010 Apr 22.
. Survey of public definitions of the term ‘overdiagnosis’ in the UK. BMJ Open 2016;6(4):e010723.
. Improving quality by doing less: overdiagnosis. Am Fam Physician 2015;91(3):162-3.
. Overdiagnosed. Making people sick in the pursuit of health. Boston, MA: Beacon Press; 2011.
. Use of a decision aid including information on overdetection to support informed choice about breast cancer screening: a randomised controlled trial. Lancet 2015;385(9978):1642-52. Epub 2015 Feb 18. Erratum in: Lancet 2015;385(9978):1622. Epub 2015 Mar 26.
. Immediate risk for cardiovascular events and suicide following a prostate cancer diagnosis: prospective cohort study. PLoS Med 2009;6(12):e1000197. Epub 2009 Dec 15.
. Immediate risk of suicide and cardiovascular death after a prostate cancer diagnosis: cohort study in the United States. J Natl Cancer Inst 2010;102(5):307-14. Epub 2010 Feb 2.
. Thyroid cancer incidence in Canada: a national cancer registry analysis. CMAJ Open 2017;5(3):E612-6.
. Regional variation of computed tomographic imaging in the United States and the risk of nephrectomy. JAMA Intern Med 2018;178(2):221-7. A randomized trial of intensive versus standard blood-pressure control. N Engl J Med 2015;373(22):2103-16. Epub 2015 Nov 9. Erratum in: N Engl J Med 2017;377(25):2506.
. Effect of intensive versus standard blood pressure control on major adverse cardiac events and serious adverse events: a bivariate analysis of randomized controlled trials. Clin Exp Hypertens 2018 Apr 10. Epub ahead of print.
. Political drive to screen for pre-dementia: not evidence based and ignores the harms of diagnosis. BMJ 2013;347:f5125.
. Evidence that supports policies to delay cervical screening until after age 25 years. CMAJ 2017;189(10):E380-1.
. Screening and prostate cancer mortality: results of the European Randomised Study of Screening for Prostate Cancer (ERSPC) at 13 years of follow-up. Lancet 2014;384(9959):2027-35. Epub 2014 Aug 6.
. Prostate-specific antigen-based screening for prostate cancer: evidence report and systematic review for the US Preventive Services Task Force. JAMA 2018;319(18):1914-31.
. Benefits and harms of screening men for abdominal aortic aneurysm in Sweden: a registry-based cohort study. Lancet 2018;391(10138):2441-7.
. Diagnosis and treatment of hypertension in the 2017 ACC/AHA guidelines and in the real world. JAMA 2018;319(2):115-6.
. Overdiagnosis across medical disciplines: a scoping review. BMJ Open 2017;7(12):e018448.
. Current approach and future perspective for ductal carcinoma in situ of the breast. Jpn J Clin Oncol 2017;47(8):671-7. Epub 2017 May 9.
. Addressing overdiagnosis and overtreatment in cancer: a prescription for change. Lancet Oncol 2014;15(6):e234-42.
. Long term effects of once-only flexible sigmoidoscopy screening after 17 years of follow-up: the UK Flexible Sigmoidoscopy Screening randomised controlled trial. Lancet 2017;389(10076):1299-311. Epub 2017 Feb 22.
. Revised estimates of overdiagnosis from the Canadian National Breast Screening Study. Prev Med 2016;90:66-71. Epub 2016 Jun 29.
. Defining, estimating, and communicating overdiagnosis in cancer screening. Ann Intern Med 2018;169(1):36-43. Epub 2018 Jun 26.
. Public opinions about overdiagnosis: a national community survey. PLoS One 2015;10(5):e0125165.
. The prostate specific antigen (PSA) test. YouTube; 2014. Available from: https://www.youtube.com/watch?v=bTgS0DuhaUU. Accessed 2018 Jun 26.
. Mapping the drivers of overdiagnosis to potential solutions. BMJ 2017;358:j3879. Epub 2017 Aug 6.
. Estimating overdiagnosis in screening for abdominal aortic aneurysm: could a change in smoking habits and lower aortic diameter tip the balance of screening towards harm? BMJ 2015;350:h825. Epub 2015 Mar 4.